I was 21 years old the first time I steadied myself to defy my father. After a lifetime of loyal adherence to what he expected from me, it wasn’t easy. I felt the full weight of his disapproval as I agreed to be a classroom teacher through Teach for America upon graduating from Northwestern University. It seems my father was ahead of his time when, in 2006, he counseled me not to go into the teaching profession. Twelve years later, according to a recent PDK poll, a majority of Americans actively dislike this option for their children. Now a parent myself, I assume this reaction is rooted in their deep-set desire for their children to live long, healthy, and fulfilling lives. I do believe this guiding principle is what caused my father to urge me to do literally anything else with my future. And yet, if my father were alive today, he’d be able to tell these fretting parents that it is indeed possible for their child to thrive as a public school teacher — and his daughter is living proof. Currently in my 12th year in the classroom, I’ve never loved my job, or my life, more. I haven’t been steadfast — there was a year when I dabbled in municipal bond sales before finding my home in the classroom. In an interesting twist of fate following two years teaching in New York City, I began a full-time position at Lehman Brothers the week that it collapsed. While Barclays Capital took a chance on us unproven first-years in its eventual acquisition, I found myself restless after the trials and triumphs of the classroom. I was surrounded by people whose years of hard work and sacrifice were gone when their promise of a huge payout vanished with the collapse of the market. Without prosperity to justify their choices, many seemed disillusioned with their careers, and I quickly realized I wanted something different. My thoughts returned to my former students, who, by then, were eighth-graders navigating the city’s complicated high school selection process. After two years with them, I had become invested in their futures and was in regular communication with their families. I wanted to do more, and I began to spend weekends taking them on tours and helping them create portfolios that showed their potential. Those days reminded me that my actions there had concrete, immediate consequences, shifting life trajectories. Ultimately, I preferred who teaching allowed me to be. And so I returned to education. I felt my father’s admonitions losing their sting. I had tested another path and found it meandering and purposeless. The classroom was where I was meant to be. The number of hours a week I spend in school has shifted since beginning a family of my own. I want my daughter to feel as valued as the kids I’ve been lucky to teach. In stepping back, I’ve had to set priorities. I turn down opportunities to lead adults while insisting on chances to work with kids. I choose to coach cross-country instead of coaching my colleagues. So often, strong teachers are coaxed into becoming administrators, but this trajectory has never seemed logical to me. If we want a lifetime in the classroom to be a compelling choice, we need to honor that it is a craft that can take a lifetime to master. We need to insist that our most passionate educators spend more, not less, time with kids. Although much can be done to elevate the teaching profession in the public eye, the truest rewards will never come from public recognition. They come when time turns the kids you were lucky to teach into adults you are eager to learn from. It’s a beautiful vision, one in which I’m proud to be but a single link. The truest rewards in teaching come when a former student’s actions reveal that your passion for education has an indelible impact. Stay, and you may one day learn that the book recommendation you gave in seventh grade led a student to reconsider whether or not she actually hated reading, and now, here she is, credits away from graduating as an English major. With each year comes another class. A new group of students who will inevitably grow up. Staying allows it to be on my watch, with my support. When former students come back to visit, they are quick to point out the changes. I want to be the constant. Teaching is a career in which you constantly sow seeds — and, if you stay long enough, you will be humbled by the harvest. I recently visited my own middle school to find my seventh-grade English teacher still presiding over his classroom with zeal and expertise. I hope to one day be just like him. To those considering this path, I urge you to defy your parents and the public and follow your heart. I urge you to rise to the challenge and find a place to stick around. As a job, teaching may have its pitfalls, but as a vocation, a calling, it remains nothing short of a privilege. Kristen Jones Unger is a middle school teacher at KIPP Rise Academy charter school in Newark. 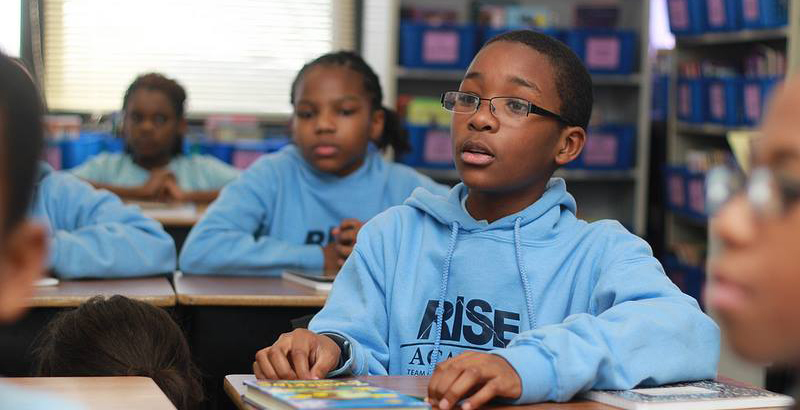 Kristen Jones Unger teaches at KIPP Rise Academy charter school in Newark.